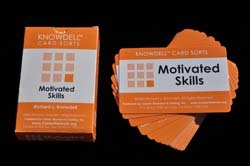 The Knowdell Motivated Skills Card Sort is one of the easiest ways to determine which skills are key to an individual's career success and satisfaction and which skills are transferable to the next career. Note that each online card deck is designed to be used only once. 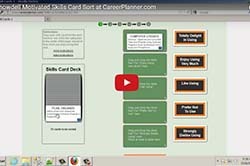 After laying out the cards, and dragging and dropping them into the appropriate categories, the individual will quickly be able to see which skills they enjoy using the most, which skills they want to improve on, and which skills they would like to avoid having to use.